White’s Bay sits along the Collingwood shoreline and was once a local fishing hole where the day could be whiled away in the summer sun. This eponymous IPA is the perfect companion for those days you take for yourself, leaving your cares behind. Golden hued, floral and fruity, this beer features a blend of Mosaic and Challenger hops resulting in a unique hybrid India Pale Ale. Coming in from the cold, still invigorated from the slopes, the trails, and the bright winter sun - there is no experience like it. Our Winter Stout is made for just this occasion. This rich, dark ale is brewed with oats and infused with cocoa, orange and cinnamon..
Our award winning Saison is the colour of the golden sun. This beer has a lively carbonation which releases aromas of luscious tropical fruit. A mellow, honey sweetness is followed by a crisp, tart finish. From a backyard party to a cozy night in, this Saison is of a fine quality and for all occasions. Serve in a stemmed tulip glass at 6-10C. Our Saison is unfiltered and sediment has settled on the bottom. Pour off the sediment for a clear beer, or rouse for more yeast character. Available in select LCBO's & brewery Tap Room and retail store. Our award winning Whitney’s Vintage Ale is a tribute to the local brewing tradition begun by Richard Whitney, Brewer & Maltster of the original Collingwood Brewery in 1860. Brewed with the same Georgian Bay water Whitney used, this ale also features a generous amount of freshly harvested Beaver Valley Gold Honey. After fermentation, we add a staggering amount of wet hops from Bighead Hops in Meaford. Serve in a stemmed tulip glass at 6-10° C. Vintage Ale is unfiltered and there will be sediment at the botom of the can. This is our Rockwell Pilsner unfiltered and dry hopped with Ontario grown Hallertau. With notes of toasted bread crust and black tea, this hop forward version of our signature Pilsner is sure to quench any hard-earned thirst! This hazy IPA is brewed with lactose and infused with Wild Strawberry. The Freestyle Brown Ale is an American Brown with a focus on a rich malt character. The late addition hops allow for a well rounded balance with the oats producing a creamy mouthfeel. Strong roasted notes are noticed in the aroma with a rich chocolate and cocoa characteristic on the finish. A light, refreshing ale packed with Mosaic and Amarillo hops – all the flavour of an IPA without the high ABV. This beer has a nice pineapple and grapefruit aroma with a hint of sweetness on the palate. This is our Rockwell Pilsner dry-hopped and unfiltered. French Aramis hops give this outstanding beer and grassy-herbal aroma. A toasty, dry, clean finish makes this beer a classic summer quencher. Blood orange and blackberry take our 3-Point Saison to a whole new level. This aromatic brew pours hazy-red with tropical fruit aromas dominated by fresh orange. A juicy sweetness is complimented by a tart, clean finish. Blood Orange Saison is the perfect summer sipper. This ain’t your father’s Mild! We took this classic English style and fused it with Centennial hops to produce our Freestyle American Mild. This light-bodied ale pours reddish-brown with an off-white head. Caramel malt and dry hopping combined with a traditional English Ale yeast offer notes of fruit and black tea. First release from the Freestyle Series- Warp Nine. A balanced blend of 55% 3-Point Saison and 45% Downhill Pale Ale blended and refermented. Third release from the Freestyle Series- Ontario IPA. India Pale Ale brewed with Ontario grown hops and barley. Second release from the Freestyle Series- Unfiltered Pilsner. Our Rockwell Pilsner naked and unfiltered. Hazy, aromatic and delicious. Fourth release from the Freestyle Series- Festive oatmeal stout spiced with orange peel, cocoa nibs and cinnamon. The fifth release from our Freestyle Series brings a new twist on our Fall Seasonal, Whitney's Vintage Ale. We took the original wet hopped, honey ale and dry hopped it with Sunset Gold Hops. 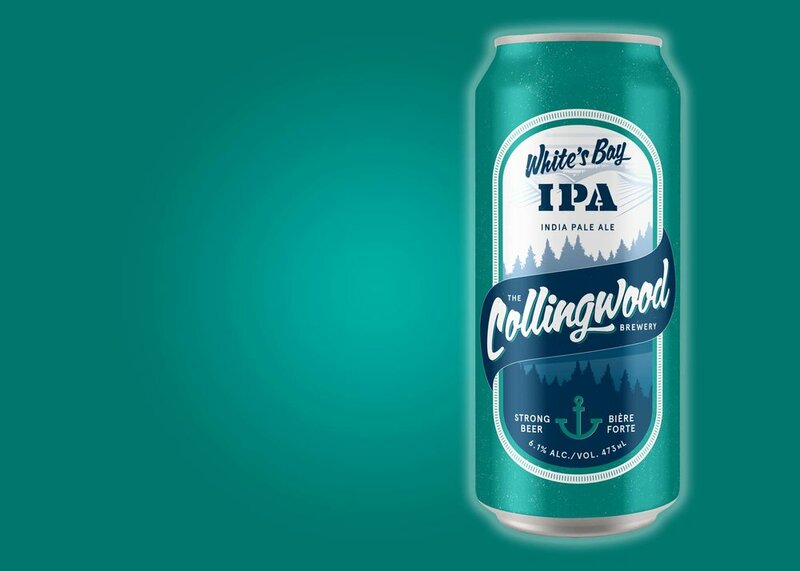 Our 1854 Anniversary Series is named in honour of the original Collingwood Brewery, founded in 1854. 160 years later, we opened our doors to proudly carry on the local brewing tradition. Our 1854 Anniversary Ale celebrates the breweries 4th Anniversary. This beer is dark brown from the specialty malt and the candi sugar. Using the Saison yeast has produced fruity esters with a sweet candy-like aroma. A slight cloudiness is apparent from the yeast with a subtle burnt sugar and molasses notes in the background adding a nice complexity. This red-hued, Belgian style ale was brewed and barrel-aged for one year to celebrate our 3rd anniversary. Serve at 6-10C in a stemmed tulip glass. Brewed to celebrate our 2nd anniversary, this Kellerbier is a traditional unfiltered German-style lager which we pack with a generous amount of German hops. Serve at 4C in a stein or pint glass. 1854 Anniversary Lager is unfiltered and pours cloudy. This farmhouse ale has been aged in Pinot Noir barrels for 6 months. Would you like to carry our beer(s)?